Energy costs have become an increasing contributor to pumping systems Total Cost of Ownership (TCO). In fact, energy cost represents 40% of the TCO of a typical pump. It is possible to reduce the electrical consumption by at least 30% utilizing Variable Speed Drives while decreasing maintenance costs associated with the mechanical driven system. 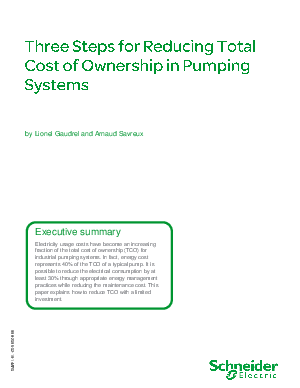 In this complimentary white paper, learn how to reduce the TCO of your pumping system with a limited investment in three key areas: energy efficiency management, asset management, and energy cost management.